This railway is open to freight. 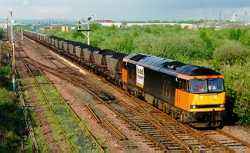 This line runs from the town of Falkirk across a short area of farmland followed by industrial estates to the port of Grangemouth on the River Forth. At Grangemouth there are still extensive quays in use and the large chemical refinery and plastics manufacturing plant. This railway runs from Falkirk to Grangemouth. The line was built by the Forth and Clyde Canal Company to block any other railway company from spoiling their monopoly of the Grangemouth harbour. The original line was single track. It was worked by the Edinburgh and Glasgow Railway. The railway came into the ownership of the Caledonian Railway when that company bought the canal company. The North British had running powers over the line. In later years (1908) the North British and Caledonian built a new joint line from Swing Bridge Junction (on the Stirlingshire Midland Junction Railway) to Fouldubs Junction to increase capacity. This re-used the line which ran to the Carron Ironworks. British Alumium opened a works at Bainsford in later years, which is now closed. It is currently double track to Fouldubs Junction and two single tracks to the Harbour and Oil Terminal. The Grangemouth shed has now closed and the site is used to load coal into wagons (see photograph, top). The container depot at the harbour and its line have recently re-opened. Closed an now the site used as a rail-served transit depot.